Thales Alenia Space, a joint venture between Thales (67 percent) and Leonardo (33%), has been selected by the Italian space agency ASI to develop an instrument called RIME (Radar sounder for Icy Moons Exploration) for the JUICE (JUpiter Icy moons Explorer) mission, part of the European Space Agency’s “2015-25 Cosmic Vision” program. 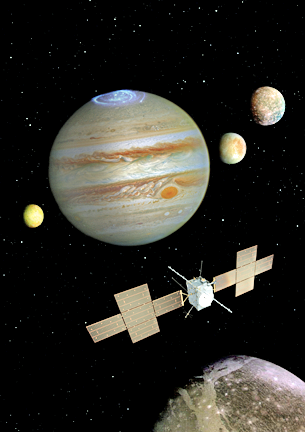 Scheduled for launch in 2022 with an expected arrival in 2029, the JUICE mission is designed to study the Jovian system and more specifically its icy moons, Ganymede, Callisto and Europa. As the archetype for the giant planets of the Solar System, Jupiter and its moons are key to understanding the emergence of life. Moreover, by exploring Jupiter's satellites — three of which are believed to harbor internal oceans — the habitability of icy worlds can be better understood. Artistic rendition of the JUICE mission. Image is courtesy of Thales Alenia Space. JUICE will perform detailed investigations of Jupiter and its lunar system, with a particular emphasis on Ganymede as a planetary body and potential habitat. The associated investigations of Europa and Callisto will round out a complete picture of these moons. Thales Alenia Space is responsible for the development, design and testing of RIME, one of 10 instruments on the JUICE spacecraft. This radar instrument is considered a key to mission success, because of its ability to directly identify and map the internal structure of the ice layers. Using a 16-meter antenna, which is provided by Space Tech GmbH under contract with Airbus Defense and Space, and working at a central frequency of 9 MHz, RIME is designed to penetrate the ice surface down to a depth of 9 kilometers, with vertical resolution of up to 30 meters in ice, covering the subsurface structure of the oceans of Ganymede, Callisto and Europa. The radar development is being funded by ASI, with the University of Trento in charge of scientific aspects. RIME includes as well a contribution from NASA. This contract reflects Thales Alenia Space’s global leadership in the design of spaceborne radar solutions, including for space exploration missions, such as the recently completed and very successful Cassini mission to Saturn and its moons. The JUICE mission also allows Thales Alenia Space to maintain and expand its strategic partnership with NASA, which started with the SHARAD sounder for the JPL MRO probe, and further strengthen its relationship with ESA, after supplying the MARSIS sounder for the Mars Express probe. Thales Alenia Space will design the digital section (DES) of the instrument and will be in charge of the development, integration and testing of the Engineering Qualification Model (EQM) and the Proto-Flight Model (PFM) of the entire radar. Within the scope of a partnership with NASA, ASI will supply radio frequency operating units designed and produced by the Jet Propulsion Laboratory in conjunction with the University of Iowa.